Tony Clement, the Conservative Party’s public safety critic is calling on the Trudeau government to do something to stop the flow of people illegally crossing into Canada via the US border. But when pressed by CBC Montreal Daybreak host Mike Finnerty to explain exactly he wants to see done, a frustrated Clement abruptly hung up. 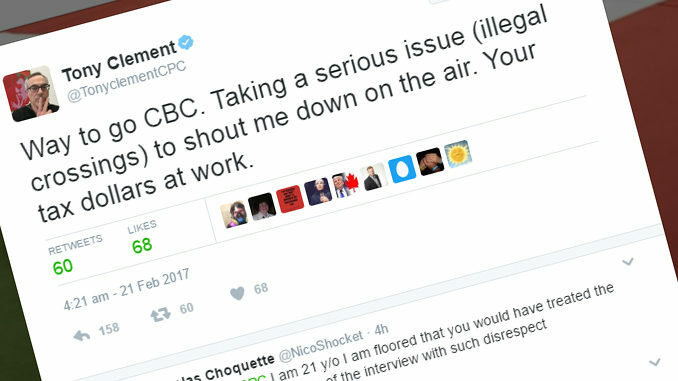 Following the interview, Clement took to Twitter to blow off steam. Way to go CBC. Taking a serious issue (illegal crossings) to shout me down on the air. Your tax dollars at work. @TonyclementCPC – Way to go Tony… collecting a salary without offering any constructive solutions. Our tax dollars at work. @TonyclementCPC You acted worse than my four children when they don't get their way. If you want to criticize, be ready to be questioned.